Hey there. 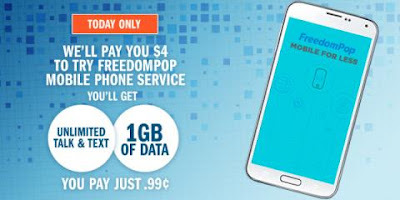 Swagbucks, the online rewards site that puts cash back in your wallet, has an AMAZING offer through FreedomPop where you get 400 SB (which is the equivalent of $4 in gift cards) for buying a SIM card for just $0.99! Haven't tried Swagbucks yet? This is a great way to do it, and when you sign up through the link above and get your 400 SB, you'll get a bonus 300 SB at the beginning of October. So that's $4 for trying FreedomPop, which gets you 700 total SB, which you can turn into $7 worth of gift cards!